My posts may have slowed as I keep swimming along, but the recipe experimentation has certainly not stopped. Just wait – come the end of this semester, it will be recipe city at Paula’s Plate. Despite my crazy schedule, however, I had to check in quickly and share with you a tasty new recipe that is perfect for Easter brunch on Sunday. 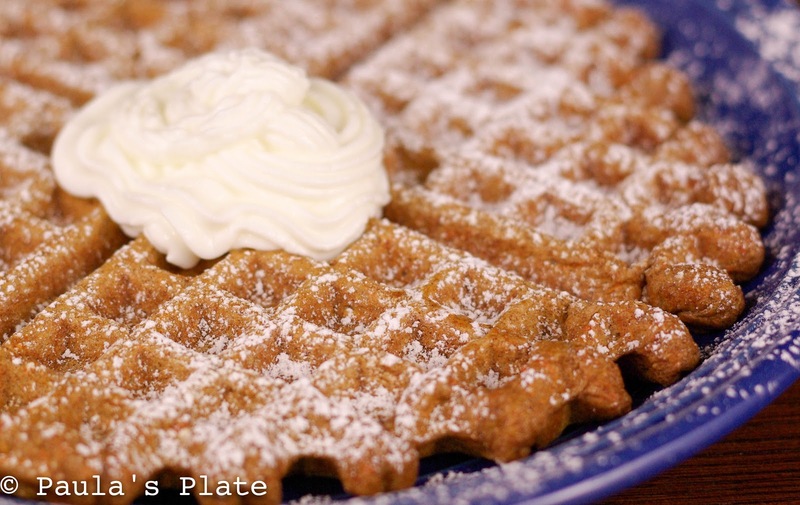 Carrot Cake Waffles! This delicious breakfast indulgence is filled with the warm spices of a traditional carrot cake and has thinly grated carrot permeating the batter. You can make the recipe a more traditional buttermilk waffle by using all-purpose flour, or yield a heartier waffle by using whole wheat pastry flour; both are equally as flavorful. It’s a slice of cake for breakfast that you actually feel good about eating! 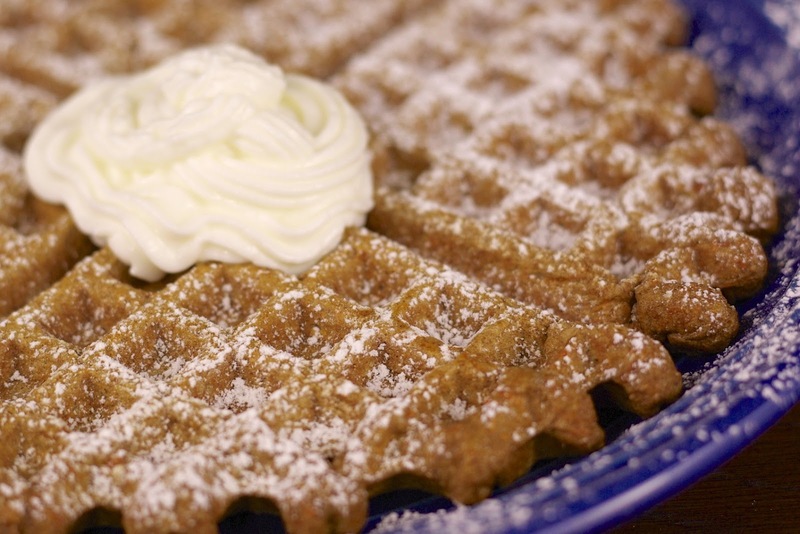 While the waffles are delicious alone, what really puts the recipe over the top is the maple-nut cream cheese topping. I discovered this frosting over at Willow Bird Baking and it is both simple and delicious. Conversely, if you are looking for something a bit lighter, try spreading some vanilla Greek yogurt mixed with a bit of maple syrup over your waffles. It adds a perfect creamy accompaniment and is equally as tasty. The next time your taste buds are calling for breakfast food (for me that is nearly every night when my breakfast-for-dinner craving hits…) give these waffles a try. They are perfect for breakfast, brunch, or dinner, and even pack a nutritional bonus with the addition of carrots in every bite. Enjoy! If you are looking for a heartier waffle, I would recommend using whole wheat pastry flour. If you are looking for a more traditional buttermilk waffle, stick with all purpose. Both are delicious, and I often split the difference by using half whole wheat and half all-purpose. When grating your carrot, be sure you use a very fine grater; the smaller the carrot shreds the better. My waffle maker is quite large and this recipe yields two sets of four waffles. If you own a smaller round waffle maker, this recipe may yeild a few more waffles. In a medium bowl whisk together first eight ingredients (flour through sugar). In a separate bowl whisk together 3/4 cup buttermilk, melted butter, egg, and vanilla. Make a well in the center of the dry ingredients, pour the wet ingredients into the hole, and whisk until just combined. Stir in finely shredded carrot. If the batter is quite thick, add additional buttermilk as needed. Spray waffle iron with cooking spray and prepare waffles as instructed by your waffle maker’s instructions. Serve warm with cream cheese frosting, vanilla greek yogurt, or a drizzle of maple syrup. Mix all three ingredients until fully combined. Recipes inspired by both Willow Bird Baking and Chocolate Covered Katie. These blogs are incredible, be sure to check them out!